Hi folks nerves are now kicking in. The bike is now packed up ready for the flight to Vancouver. Packing there’s a tale I laid it out on the grass last weekend to go through what needs to be taken. Then comes along my son who ruthlessly went through it again chopping it down. I thought a nail file and body buff was essential he had other ideas!!! Well you have to have some luxury don’t you and I do like to smell nice for the occasional bear? My flight leaves from Gatwick this Friday morning and I get into Vancover just after lunch time Friday. Saturday is going to be busy as I need to go shopping and check out the MEC for my last minute stuff. Essentials like bear spray and bear bangers plus food and a knife yes going all Ray Mears, and then back to reality a new SIM card for my phone I’m not that stupid!!! I have made my first contact with my warm showers hosts in Hope and Hilary and Pete have kindly offered to put me up in there place. They have updated me the weekend is the first Bank Holiday across there so traffic will be very heavy and they have come up trumps. They are down in Vancouver for the weekend and on Sunday are coming across to pick me up from my hostel and going to drop me off just outside Vancouver to get me started which is very kind of them indeed. I will then cycle to Mission or thereabouts for the night and then make my way up to Hope and their place on Monday one day ahead of my planned departure. My last few days have been spent out on my bike and going out for Some very nice meals out with family and friends. Tomorrow is a girly day out with my daughter before she heads out west on Monday but she is going to America so we will not be meeting up. 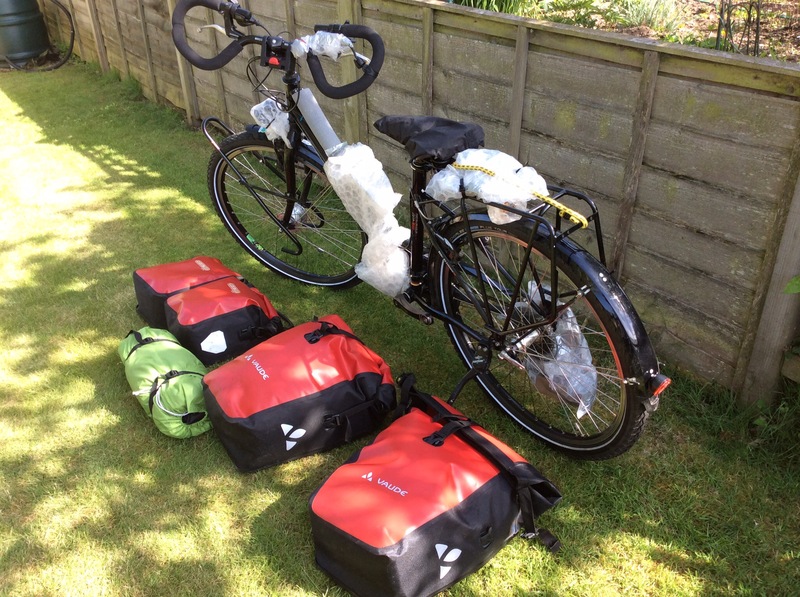 All my panniers packed 21kg plus what the bike weighs now not sure now I have put on the racks etc. scary the thought of carrying all the gear but I’ll manage I’m sure. Will blog again from the other side of the pond. It’s seems to have been absolutely ages Liz, since you first booked the time off work and now you are almost there… I’ll be waiting for a photo of that bear!